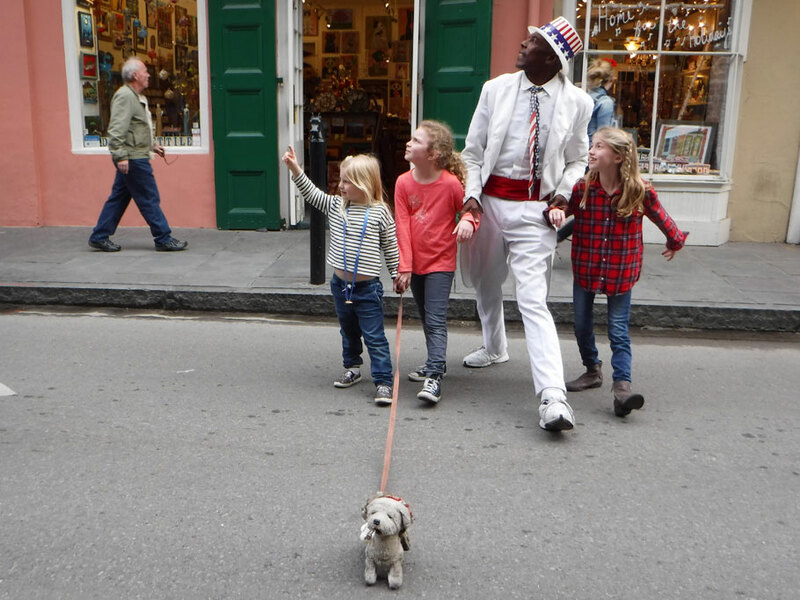 On the street in the French Quarter. December 19 – December 27. I spent a lot time in New Orleans worried about rats. Worried they would get stepped on, worried they’d play with the cats too rough, worried they’d hide food in my bed, worried they’d get lost, worried they’d escape out the door. Their names were Buffy and Veronica and although they didn’t slay vampires or solve crimes, they were mini forces of female determination. These rats, unlike, I assume most New Orleans rats, were pets. They belonged to my niece Ariadne. Ariadne lives in a shotgun apartment just big enough for her, her art and antiques, her lamps, her books, some furniture, her banjo, her clothing, lots of hats, three cats, and two rats, so when we were visiting her, she stayed with her boyfriend and we stayed with Buffy, Veronica, Pierre, Willow, and Wesley. 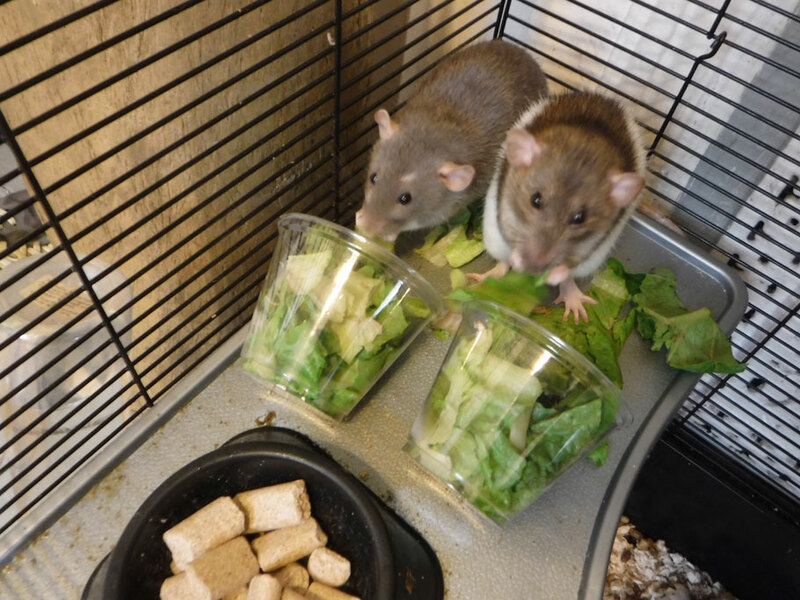 Buffy and Veronica love their vegan pellets, but they really loved this fresh lettuce I gave them. 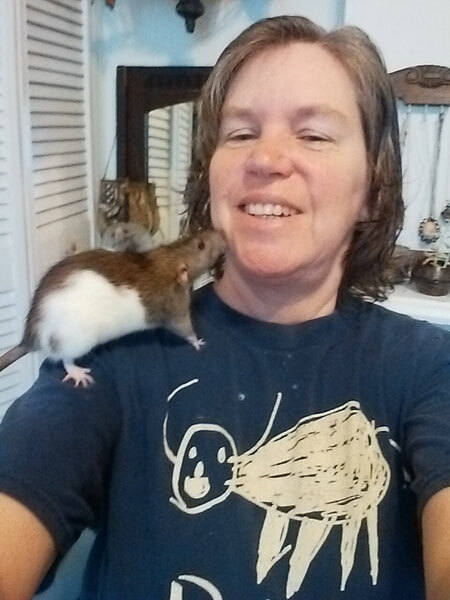 Veronica climbing on my shoulder. They are extremely curios creatures. It was a little cold during our visit. 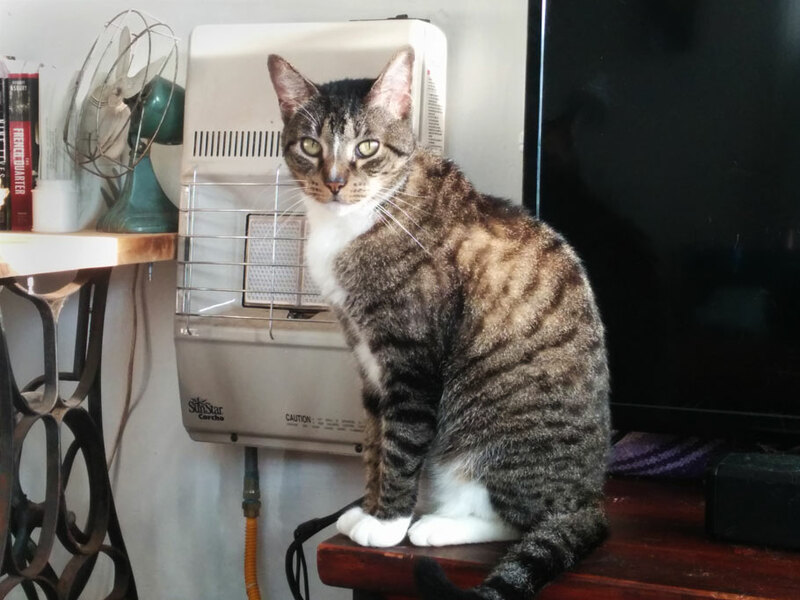 Pierre liked to station himself next to the gas heater on the wall. He was not happy when it warmed up and we turned it off. Willow in her favorite spot on the bed. 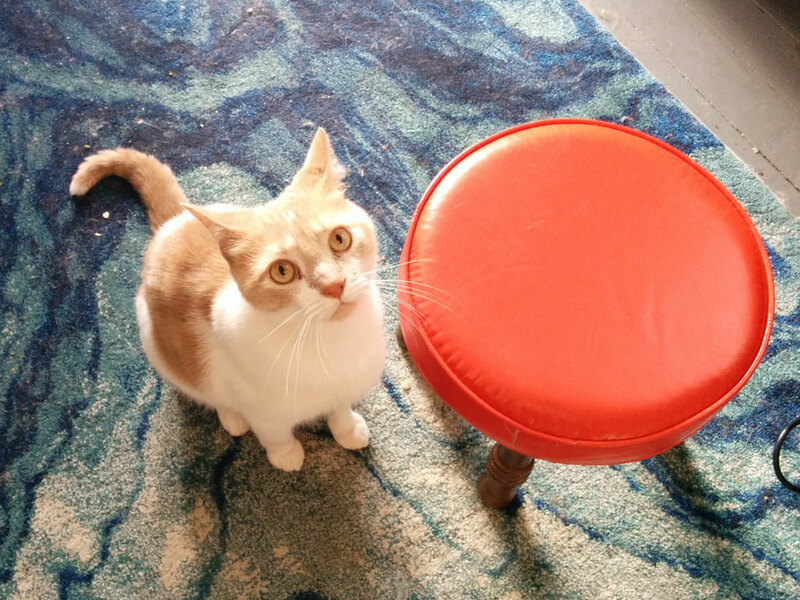 Wesley was the most mobile of the three when he wasn’t hiding under the bed. After visiting New Orleans many times in the past and the week we spent there this past December, I have decided that it isn’t a city you can just visit and come away with anything really meaningful to say about it. There are so many layers to the place. Driving through the streets there are so many stories, so many mysteries. Just hitting the tourist highlights of New Orleans can’t do it justice. One needs to be embedded. My niece has lived in New Orleans for 5 years now. She is a â€œstarving artist,â€ an up and coming playwright, who makes her steady living giving ghost tours in the French Quarter and making and selling unique lamps and other handicrafts. Just recently, she was commissioned to write a play about the first New Orleans police woman, Yvonne Bechet (Soon to be produced. Here’s a link if you are interested in knowing more about the play). 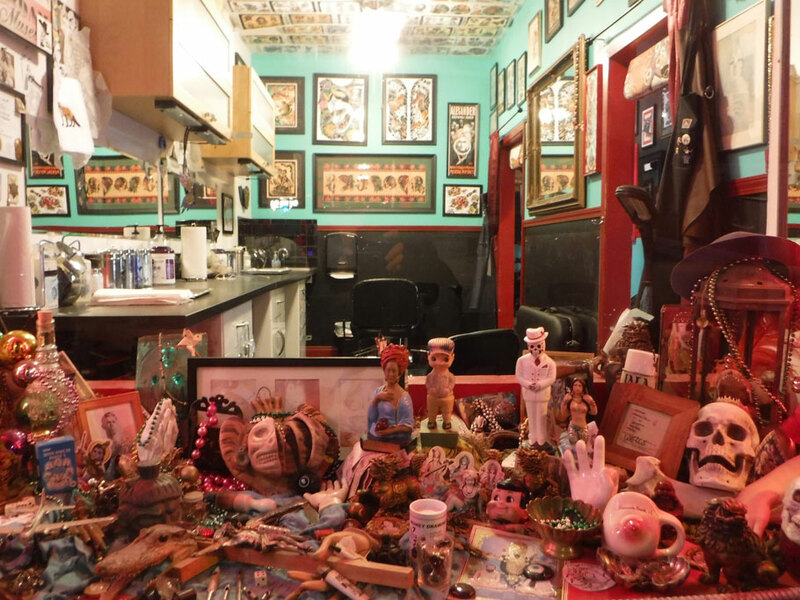 She sells her lamps and crafts at hip New Orleans crafts shops where the clerk is likely to have a tattoo that runs across her face. Her friends are artists and actors. She knows where to park in the French Quarter. My niece is embedded. 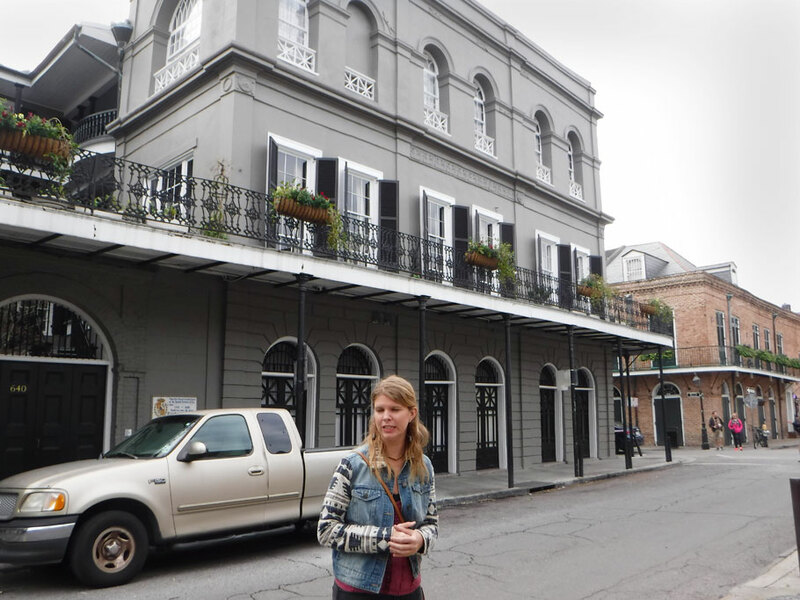 Ariadne slips into Ghost Tour Guide mode as she tells us about the Lalaurie Mansion and Madame Lalaurie who kept and tortured slaves in her attic in the early 1800s. The terrifying truths of Madame Lalaurie’s grizzly deeds were only discovered when a fire broke out in the mansion’s kitchen and fire fighters found a slave chained to the stove. As stories of the tortured slaves got out a mob ransacked Madame Lalaurie’s home and drove her from the city. So this post isn’t really about New Orleans, so much as about living just a tiny bit of my nieceâ€™s life. We met her boyfriend – a handsome actor and social media specialist for a local radio station, we met her friends, we drank at her favorite bar, we followed her as she led us around the city, and lived in her home where we met her neighbors, one an older woman who weathered the storm and the floods of Katrina in her home alone with her dog, and another who might be described as a little crazy. 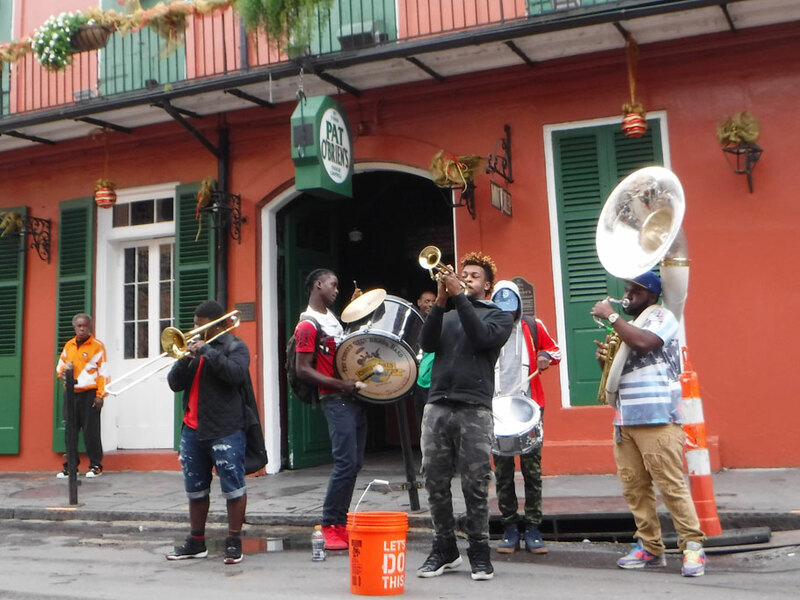 Jazz band playing for tips in the French Quarter right outside of Ariadne’s favorite bar. 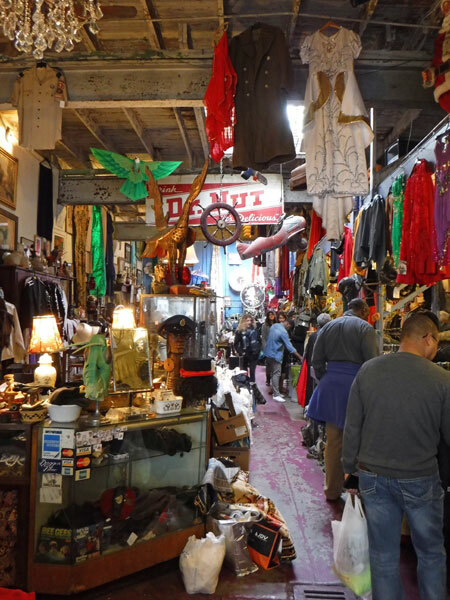 We visited one of Ariadne’s friends whose family owned a chandelier shop in the Quarter. 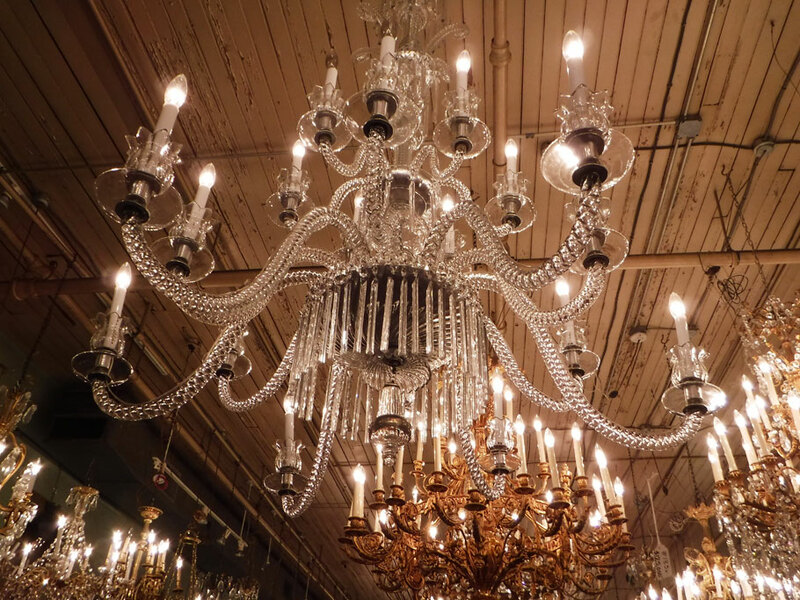 Most of these chandeliers come from Europe. They have to be completely disassembled in order to be shipped. Needless to say, they cost a pretty penny. 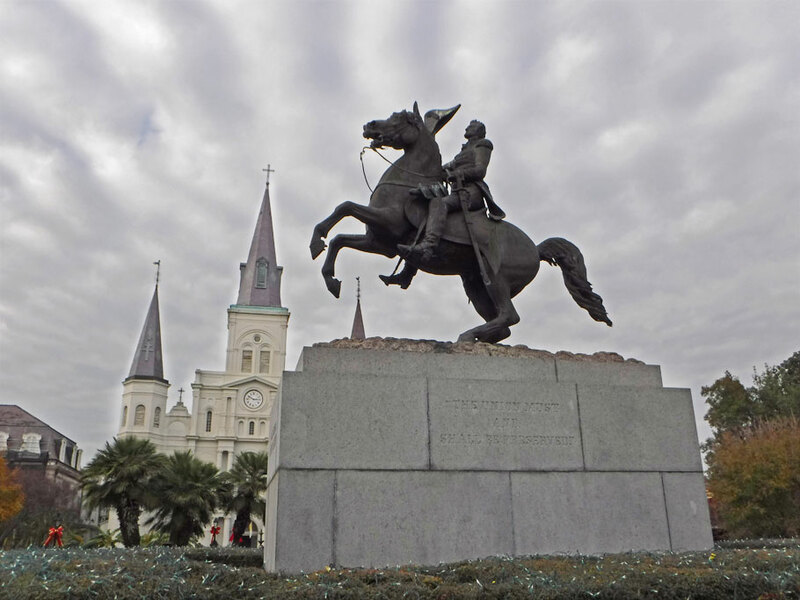 Statue of Jefferson Davis with St. Louis Cathedral in the background. Shopping with Ariadne for her wardrobe of gothic and black outfits for her job as a Ghost Tour Guide. 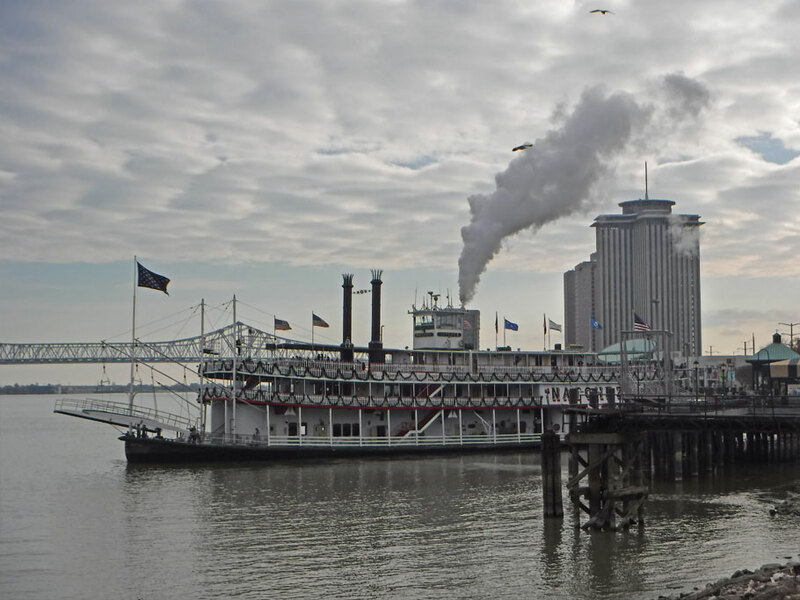 The steamboat Natchez undocks and heads up the Mississippi River. 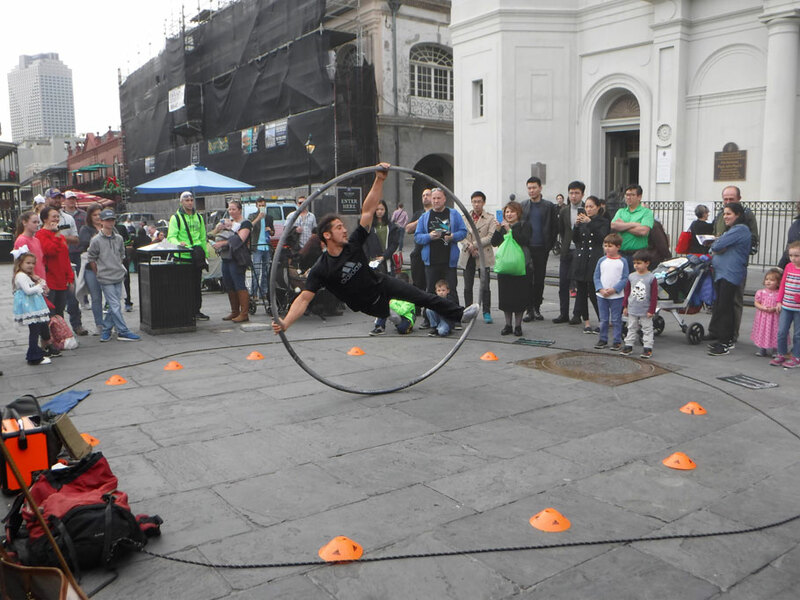 On our tour through the French Quarter with Ariadne we zoomed right through Jackson Square with all of the vendors, tarot card readers, artists and performers, but this one was pretty good. We stopped and watched him for a few minutes. Ariadne took us to Frenchmen Street where the locals hang to hear live music in small clubs lining the street. There were other local business there too, like this colorful barber shop. I am envious of my niece. She is young and has an interesting life. She has good friends. She lives in an amazing, vibrant city. She has weathered a few storms in the past few years, but she has bounced back OK, and like Buffy and Veronica she has great determination. 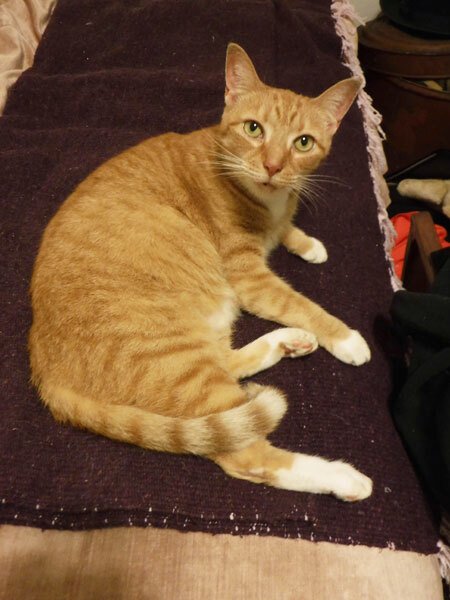 Ariadne left us on our own over Christmas and flew to Colorado with her boyfriend. This gave us some time to work on another project for the van. 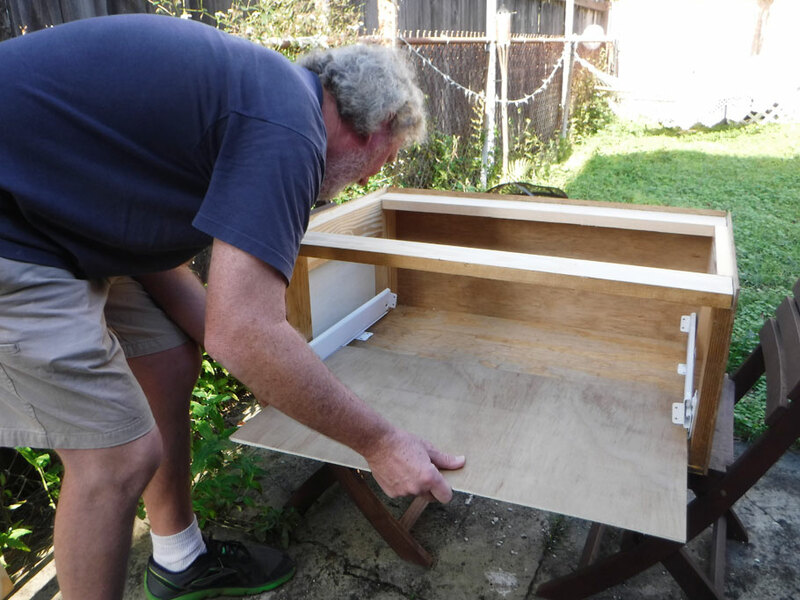 Here Greg is building a cabinet with a sliding drawer. 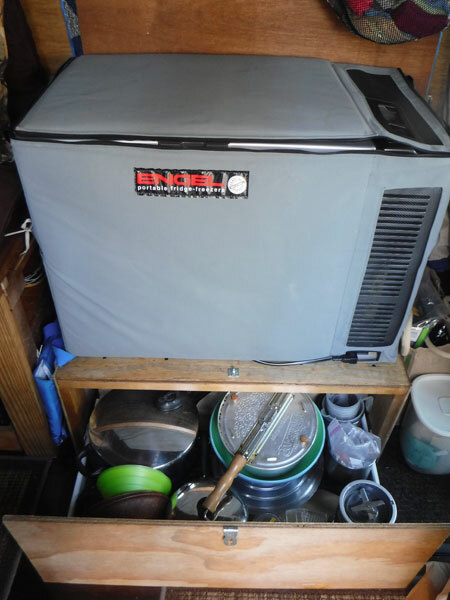 The finished cabinet with the refrigerator sitting on top. The finished cabinet open full of stuff. PS – as you can see we are still slowly trying to catch up the blog. If you want to stay more current with us, you can follow us on Facebook at https://www.facebook.com/MakeLikeAnApeMan and if you want to stay really, really current with us follow us on Instagram at https://www.instagram.com/makelikeanapeman. We try to post on Instagram every day we have internet. 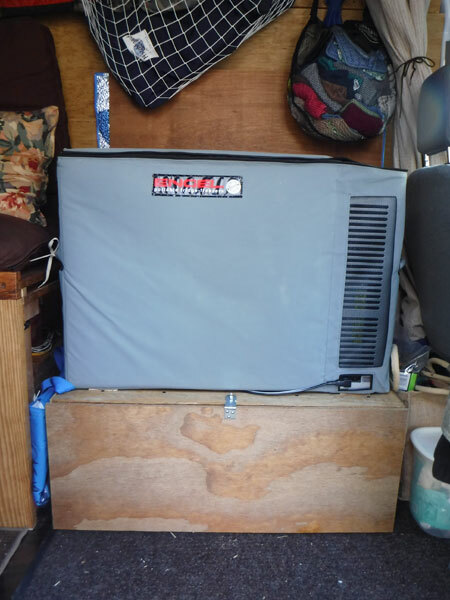 This entry was posted in Louisiana, Travel On The Dirt, Van Projects and tagged new orleans, van projects, vanlife. Bookmark the permalink. Enjoyed hearing about New Orleans and Ariadne! Continue having fun!